When I first saw that the Joe Fresh boutique was open in jcpenney, I immediately emailed a Florida friend who I've sent Joe Fresh sweaters to in the past (after she saw this post): "Go to your jcpenney, Joe Fresh now in house!" Shoppers across the U.S. should pretty much be jumping for joy now that Joe Fresh is available beyond the tri-state area. 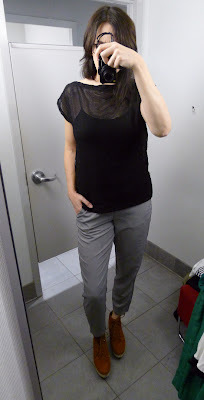 A few weeks ago, I had a few minutes and tried a few things on at the Manhattan Mall store. Below is a teeny-tiny representation of what Joe Fresh has to offer, as there are also several great dresses for spring and summer. I love the steel grey relaxed-fit pants (above, left) as soon it's going to be 90+ degrees in New York City and this easy, pull-on style isn't going to cling. Although I paired the pants with the black mesh boatneck top (this comes in white also), they're a great neutral for brighter colors, too. Also, how cute is the panel sweater with the ankle-zip jean? Don't get hot thinking "sweater" and "jean" because both are made from very lightweight materials. 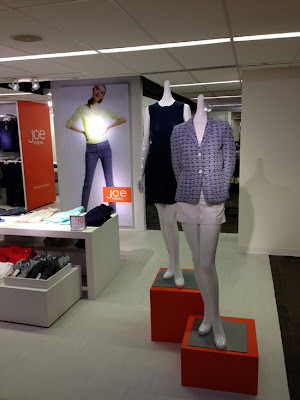 Joe Fresh has numerous, sorbet-colored pant options in store, so stop by soon and get your spring color palette going.